I don’t remember many details. I don’t even remember where it was; maybe Santa Monica. I do remember that Dr. Brown picked me up in his VW Bus and we chanted Nam-Myo-Ho-Renge-Kyo all of the way there in order to keep his car from breaking down. I’m not sure where I was staying. It might have been my mother’s place, briefly, but I believe it was the little two-bedroom house I rented along with Doug Ochsner, his girlfriend Phyllis Southard, and Robyn Ballard, my girlfriend. And shortly after leaving the hospital I began working in factories in Newberry Park, first assembling oil filters for jet engines and later silk screening electronic substrates for newfangled digital watches. in any case, with Dr. Brown driving, we took the freeway south and ended up in a living room with about 15 people gathered around a wooden box with open doors that had a scroll hanging in it. A gohanzan (the mandala that manifests Nichirin’s enlightened mind) in a butsudan (Buddha’s house). Again, my memory is hazy — I had been hit pretty hard on the head. But my impressionistic memory is that the people were friendly but also formal and strict about etiquette. They also struck me as true believers, rather regimented. There was some kind of explanation, and I was told to choose something that I wanted to obtain and to start chanting Nam-Myo-Ho-Renge-Kyo and I would receive it if I was sincere and chanted enough. I found the words exceptionally difficult to say at first. My mouth could hardly make the sounds — my own native tongue was difficult enough at the time. But it became easier with practice, though I never reached the breakneck speeds most of the groups chanted at. 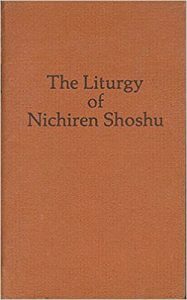 Cover of the Nichiren Shoshu Gongyo booklet. 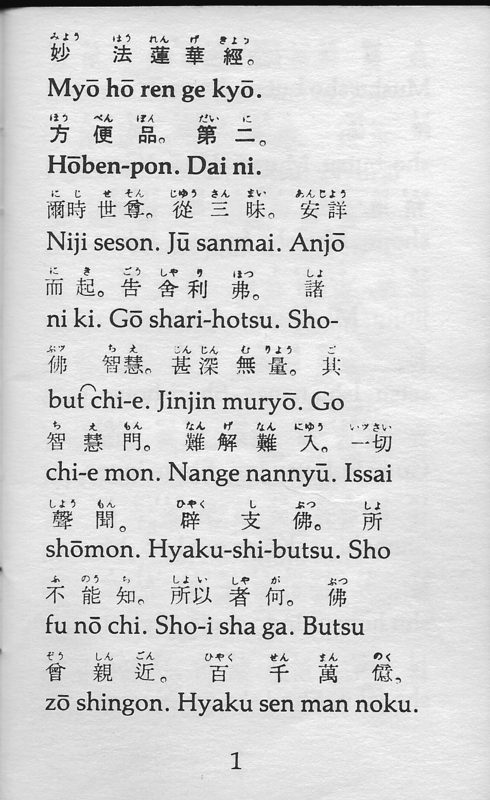 The beginning of the Nichiren Shoshu Liturgy (from the 2nd Chapter of the Lotus Sutra). 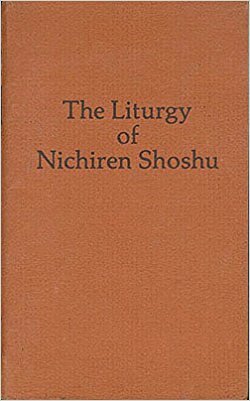 They, or Dr. Brown, also gave me a copy of Gongyo, The Liturgy of Nichirin Shoshu, which consists mainly of the second and 16th chapters of the Lotus Sutra written in Kanji with English phonetic transcriptions. 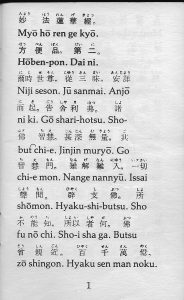 Unlike the video below, which is of a NichirenPriest chanting slowly to help beginners learn to do Gongyo, groups consisting of a mix of experienced Japanese and Americans generally did Gongyo at breakneck speed and it was up to newcomers to practice enough to learn to keep up. In my condition, it was hopeless. Dr. Brown went out of his way to help me to attend meetings, despite how flaky and reluctant I was. Somehow, he even arranged it so that I, despite the delusion in which I was completely enveloped, could attend a Gojukai ceremony with the priest at the Myohoji Temple in West Los Angeles, and also to receive a Gohonzon from the priest. During the ceremony, the new believer takes the Oath of Acceptance of Nichiren Shoshu. After reciting the sutra (Gongyo) and chanting Daimoku (chanting Nam Myoho Renge Kyo), the new believer receives the precept from the priest who is holding a Gohonzon (Object of Worship) in his hand. The new believer vows to uphold true Buddhism in this and all future existences. Well, the thing is, it did just work. By trying to chant the daily practice, and by chanting the Daimoku as often as I could bear to, I rapidly recovered my ability to speak. But the anti-intellectual view of the practitioners combined with the fact that all of the group practices were in towns that required significant driving and the erratic lifestyle I was leading to separate me from the practice rather quickly. I’m not sure how long I practiced what little I practiced. It might have been weeks or months. It’s all a blur of factory graveyard shifts and a perpetual headache. I didn’t really consider myself a Buddhist at that time because I had no idea what that meant — and my experience with the Soka Gakkai did little to enlighten me on the subject. 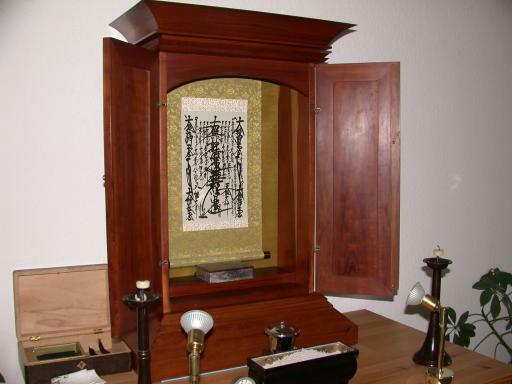 Nor did I treat the Gohonzon with the respect that it deserves. Somewhere along the line, I lost it and the butsudan I had kept it in. It was a path I couldn’t commit to, partially because I wasn’t sure what the path actually was. But it was also the first spiritual path that I had ever encountered that actually made a change in my life. One could even say that it saved my life, even though I gave it scant service, little honor, and no respect. For this, I will always be grateful to Nichiren, the upholders of his lineage, and the practice groups that do their best to uphold his teachings. Nor was this my final encounter with Nichiren or with the Soka Gakkai — and my next encounter was much deeper and the separation more final. But it was also much later, after much wandering in the wildernesses of samsara. And that story is also for later.